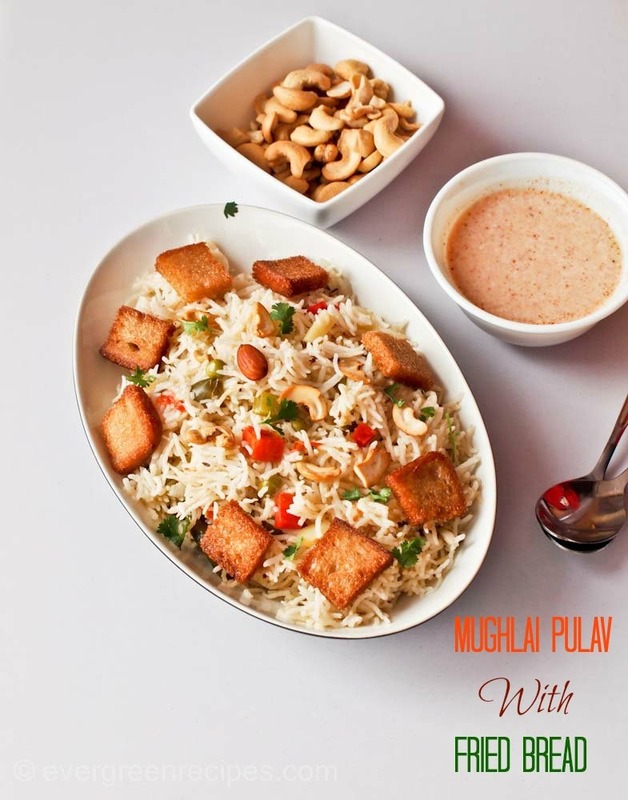 Presenting the recipe of Mughlai Pulav with fried bread. 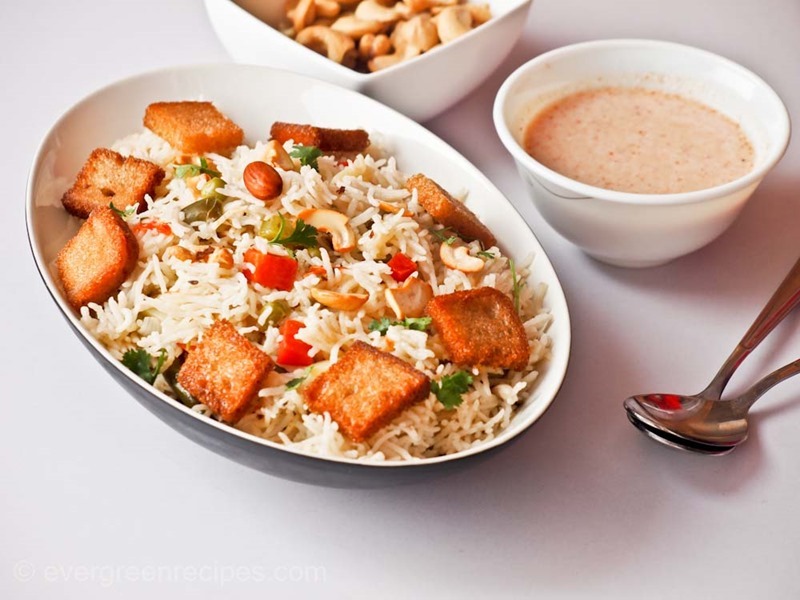 If you have a thing for Mughlai food then you are surely going to love this one as well. People think it takes a lot of time to prepare Mughlai food, let me tell you it’s a myth. 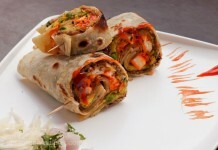 At Evergreenrecipes.com, we show you the easiest way to cook any kind of food with our step by step instructions with photos. 1. Clean, wash and soak rice for half an hour before cooking it. Chop the vegetables. Heat the wok with 3 tbsp oil and temper with cumin seeds, fennel seeds, cinnamon stick, bay leaf, cardamom green & brown, cloves and black pepper. When cumin seeds starts crackle add onion. 2. Fry onion till it is translucent in the color. Add chopped carrot, capsicum, potato and green peas. Fry the veggies for 3-4 minutes on a medium flame. 3. Add ginger-garlic paste and tomato. Cook for another 2-3 minutes on a medium flame till the raw smell gone . 4. 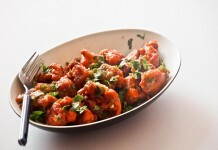 Add green chili, chopped coriander leaves and water. 5. When the water starts boiling, add soaked rice. 6. Add lemon juice and salt, mix it well. 7. Cook covered on a high flame for 1-2 minutes, then keep the flame low and cook for another 12-13 minutes or till the rice cooked properly. 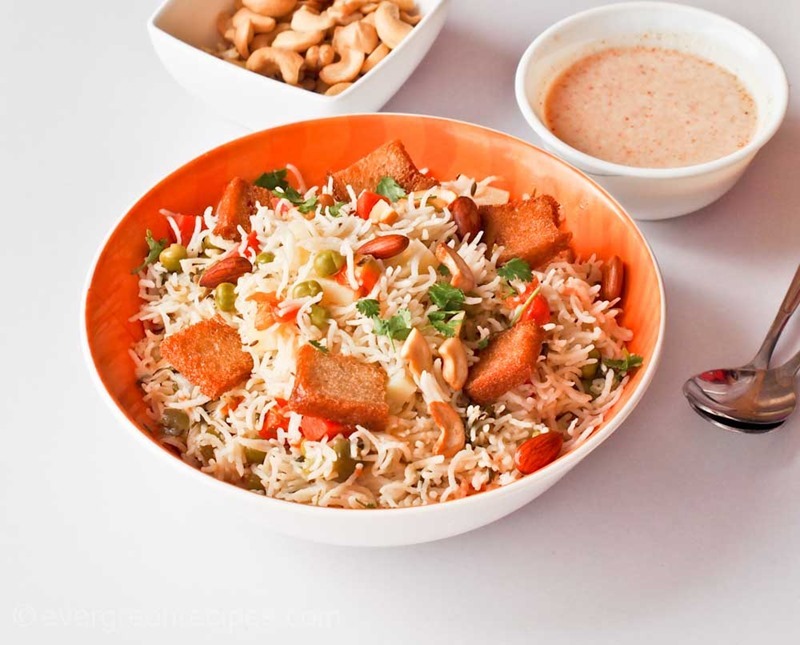 Garnish with fried bread pieces, cashew nuts and almonds. Serve hot with curd or any curry.